Cornafean Junior Scór first round on the 16th November in Ballinagh at 3pm. 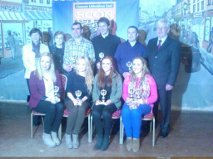 Winners of Scor Sinsear Cavan 2013, Céilí Dancers of Noelle Fitzpatrick, Joanne O’Reilly, Laura Galligan, Lynn O’Reilly, Helen Cartwright, Eamon Gaffney, Ciaran Reilly and Niall Eames, and the Tráth na gCéist team of Brian Doyle, Michael Dinneny and Tommy McGibney. Music, song and dance have always been very much part of the fabric of social life in Cornafean over the past hundred years. Cornafean GAA club named Cumann Naomh Fionnán was founded by Paul McSeain in 1908. It grew out of a thriving Gaelic League Cumann, which was part of a great cultural awakening which was then sweeping the country. At that time Cornafean became imbued with a gaelic spirit which has permeated the area ever since. This was enhanced by the foundation of Scór in 1969. Since the 1970's few clubs in Ireland have participated and gained as much enjoyment from Scór as Cornafean and the area remains a stronghold for the Gaelic tradition. No mention of Scór in Cornafean would be complete without highlighting the huge contribution of Paddy McDermott. Through Paddy's love of music, particularly Irish music and his special understanding of young people he has developed a lasting rapport with the youth of Cornafean and created in them an appreciation of Irish music and an unique skill in its performance. 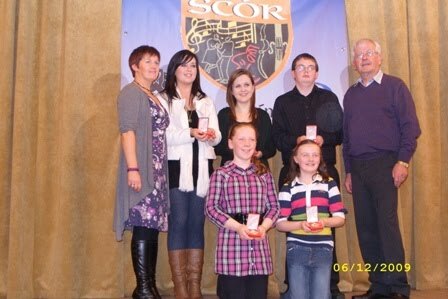 Year after year Paddy motivates countless young people and adults to participate and help in Scór competitions. In 1979 Paddy was elected as cathaoirleach Coiste Scór an Chabháin, a position he still holds today with the same enthusiasm as the first day he was eleccted. So many people in Cornafean and Cavan owe Paddy an immense debt of gratitude. The Cornafean area is well known for its question time enthusiasts and teams have acheived considerable victories over the years. The club made its first appearance in the All-Ireland finals in 1981 with the team comprising Martin Maguire, Michael Dinneny and Bernard Martin. They defeated hot favourites Warrenpoint in Ulster but unfortunately lost out narrowly in the final in the National Stadium. Cornafean tasted glory in 1984 in Scór na nOg in City Hall, Cork. The team was made up of Geraldine Martin(Bruce), Jimmy and Tommy McGibney (Corliss) and sub Margaret Young (Drumgoon) RIP. Credit to due to their mentors also: Bernard Martin, Michael Dinneny, George Cartwright, Martin Maguire and Joe McMahon. Christy Cooney and Des Maguire. 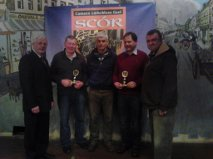 Without doubt the most successful Scór team in Cornafean is Tommy McGibney, Brian Doyle and Michael Dinneny. They have dominated the county scene over the recent past winning 15 county titles and 11 Ulsters. They first acheived All-Ireland glory in 1993 at Green Glens Arena, Millstreet and won further All-Irelands in 1997 and most recently in 2008 at the INEC in KIllarney. Joe Mc Donagh, Michael Dinneny & Fergal Dinneny. Cornafean made their first All-Ireland appearance in 1974 in Scór na nOg. The team was Fergus Barry, Frank Donohoe and Geraldine Donohoe. The team was narrowly beaten in Limerick after impressing in Ulster. This was Cornafean's first major acheivement in Scór. 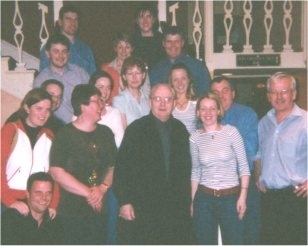 Cornafean contested the All-Ireland Scór na nOg final in 1991 and won it in 1992 in the Gaeity Theatre, Dublin with a sketch written and directed by Sean Masterson, who has given loyal service down through the years. The team was Cait Masterson, Brendan Geoghegan, Adrian Harrington and Sean O'Reilly. 2006 was a memorable year for Scór in Cornafean with three items been contested in Killarney. While the question time team and Michael McGibney, in the recitation, were experienced competitors, the novelty act team with their rendition of "Matties Return" were also representing the club. Unfortunately Cornafean were narrowly beaten but the team certainly proudly represented the club, county and province extremely well. Recitations in Cornafean are very popular and the club has excelled in this item over the years. The first county title was won by Jim Hannon in 1972. Other county winners were Darina Sheridan, Margaret Young (RIP), Claire Barry and most recently James Cartwright. However, recitation in Cornafean is syonymous with one man: Michael McGibney. He is the most successful single competitor in Cornafean with 6 Ulster titles and an All-Ireland victory in 2006. His rendition of "Doing the Double" will live long Cornafean's Scor history. It captured the hearts of the capacity audience and judges alike and he got a tremendous applause from the whole audience when his name war read out. Michael also contributed greatly to training youngsters for recitation and novelty acts and has also acheived success in Scór sinsir with the novelty act. Cornafean has a rich tradition in instrumental music down through the years. The club contested its only All-Ireland in 1998 yet the club has had a good success rate at county level with 24 county titles. Members of the groups have also played music for numerous dancers throughout the history of Scór. Cornafean most successful era for singing came in the 1970s with notable successes in solo singing and the ballad group. Lil Smith won three county titles in a row in Scór na nOg in solo singing in 1974, '75 and '76 culminating in an All-Ireland appearance in 1976 in Clara, Co. Offaly. Her sister, Valerie, won the county solo singing title in 1976, and Siobhan Moyles made it six in a row for the club with wins in 1978 and '79. In senior Scór Lily Donohoe won a hat trick of county titles in solo singong between 1978 and '80. Cornafean had to wait untill 2007 when Aisling Corcoron won a county title in Scór na nOg. The 70s were a successful period for the ballad group also. Led by Lil Smith the group secured a double of county titles in '74 and '75. Members of this group were Lil Smith, Pauline McDermott, Marie Brady, Mary Galligan and Colette Mc Dermott. In recent years Cornafean has captured a trio of county tiles from 2008-2010, coached by Geraldine McCaffrey. Great efforts have been made in recent years to revive the fortunes of the club's dancers and this hard work is now beginning to bear fruit. The set dancers won the county title in 2008 and repeated the trick again in 2010. This was a great acheivement and credit has to go to Eamon Gaffney and his dancers on this enormous improvement. The club has won numerous county titles, overall county awards, Ulster titles and 6 All-Irelands. Scór has added a totally new dimension to social life in the area in the forty years. Supportes and competitors have enjoyed countless nights of entertainment preparing and taking part in Scór or just going along to watch. Today we remember the many people from the Cornafean club who have participated in Scór over the years without ever featuring on the All-Ireland or Ulster stages. It was they who built Scór in the club and contributed handsomely to numerous overall awards. The club has always had an abundance of volunteers who have coached, helped and supported the participants behind the scenes. It is this combination of hard work and no little talent that has helped make Cornafean the most successful club in Scór in Cavan.